NUMBER OF ARTISTS: 2; usually I share with someone else, but she needed the whole studio for BOS, so this year I found a different space. TIME IN BUSHWICK: One month. SHARED STUDIO: Yes, two artists. 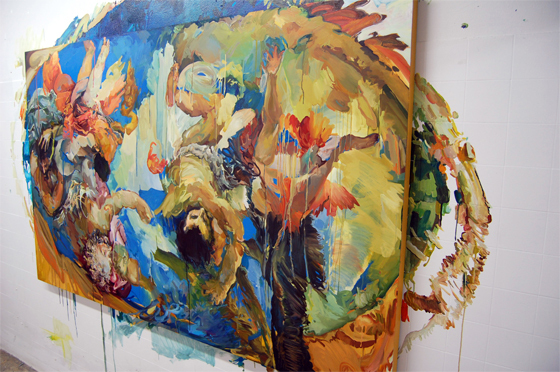 Elsie Kagan makes luscious paintings of falling cherubs and bright skies. 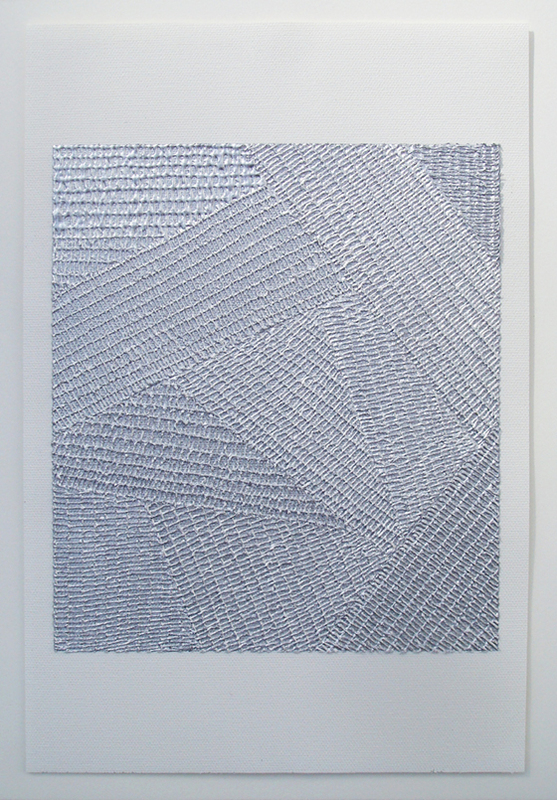 Danielle Mysliwiec makes paintings by weaving paint together. They share a studio and have been painting for years. We’ve discussed both artists’ work on the blog, and we wanted to catch up with the two of them to see how their work has evolved. This is what they told us. Elsie, you’ve been painting for 15 plus years. Do you think your paint handling has changed over the years? Why or why not? EK: This is an interesting question because it made me realize that despite the many variations in my work over time, my paint handling has remained quite consistent. Echoes in my current work can probably be seen in paintings I made at 15. For me, painting is a deeply material process, and the physical interaction of the pigment and brush and canvas stays thrilling and new, but one that is also deeply familiar in my technical process, my muscle memory, and my mind. Beginning a painting is like heading off the edge of the map, and it’s this exhilaration—and fear—that keeps me in the studio. It means that however difficult the process of being a working artist is, I am not sure I could be fully happy doing anything else. Your paintings of cherubs and other baroque imagery used to be contained within the canvas, but now they spill out onto the wall. I always thought they resembled ceiling paintings, so this move made sense to me, but I wondered if you could discuss that decision. EK: It felt like a natural direction to explore. For many years I have been integrating ideas about architecture and framing into my canvases. I’ve been itching to go in the opposite direction and explode the painting into the room. 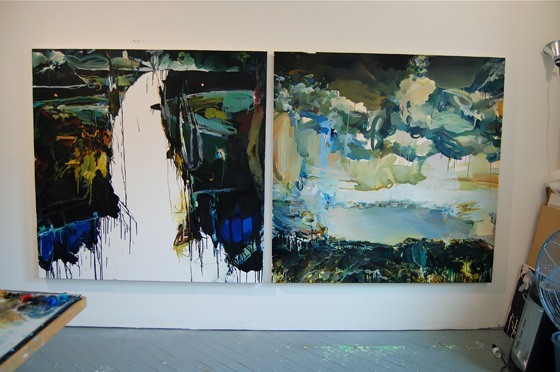 Can a painting both contain itself and need a specific environment? I am interested in looking into this further. Danielle, you live in Washington DC. How many studios do you maintain and how, if at all, does this affect your studio practice? DM: At this point I have 1.5 studios. One at home in Takoma Park, where I do all of my painting, and the .5 is for the studio in the 1717 Troutman building that I’ve casually shared for the last 2 years. That one I only use for studio visits at this point. I tried painting in both places for a while, but I couldn’t really get “into the zone,” so I’ve centered everything in my home studio. I like being able to walk into the studio and pick up the conversation where I left off the day before. When I was trying to paint in two cities, it was as if I was trying to have two conversations at the same time – confusing and not very fruitful. When I come up to New York now I want to spend all of my time seeing people and art and I run around frantically doing so. My home studio looks out over our land and I can watch the deer and the foxes and the seasons go by. This week, I actually started painting in the screened in gazebo that came with the place and it’s like I’m painting in the middle of a forest. That’s the kind of environment that truly allows my brain to let go of the everyday to-do lists and open up a more contemplative space for making work. I love it. I should have built a gazebo when I was back in Brooklyn. You gave a talk at SVA about two years ago and talked about how giving up fighting against your natural inclinations as a painter improved your painting. I’d say that’s good advice for a lot of artists — forced expression tends not to work out that well — but I wondered what techniques you have to keep yourself from falling into habit. DM: My work tends to be so labor-intensive that most of my time traditionally has been put into technical execution. So I often find myself in a space that can vacillate between meditation and mindlessness. And mindlessness, like habit, can be comforting, but not necessarily productive. Lately I’ve been putting a lot of energy into building experimentation into my daily practice. This has taken the form of creating small works on paper, which happen much faster than my large works. On the smaller scale I can respond spontaneously to questions and inspirations as I have them, rather than waiting until a large piece is finished, by which point those questions can feel stale. I try to start each session now by working on one of these. This keeps me generating new ideas and new directions while the larger more tedious work is underway. I’ll be showing both small and large works at BOS. You’re both taking over Joshua Abelow’s old studio. How did you find it, and what made you decide to share a studio together? EK: Danielle can take all the credit, and I am very excited to be sharing the space with her for the month of June. Danielle has been an incredible support over the years, though the process was much easier when we lived near each other in Brooklyn and were regularly able to visit each other’s studios and works in progress. It will be great to spend some quality time with each other’s work again. DM: I met Josh at the Vermont Studio Center in the summer of 2010. I visited his studio this past fall and when it came time for me to find a space, I emailed him and it turned out that he was subletting his studio for June. I find there’s a nice flow of people moving in and out for residencies, teaching gigs, etc…so it’s easy to come and go. I had my first child at the end of January and, being determined to disprove the myth that motherhood makes woman drop out of the art world, I decided to set a goal for myself of showing new work with BOS as my deadline. Elsie is also a new mom and she and I met in the art dept at Wesleyan during our undergrad years. We have stayed in close touch and I thought it would be fun to share that goal and ultimately to spend the weekend hanging out together. Which do you prefer: Lower East Side or Chelsea? DM: If I’m honest, my answer to this question might rely most on whether I’m in the mood for the Salt Baked Combo from Noodletown on the Bowery or the Pork Dumplings from Grand Sichuan on 24th. On a more art related note – the LES galleries such as James Fuentes, Rachel Uffner, and Nicelle Beauchene represent a lot of emerging abstraction that I feel very aligned with so I go there to keep in touch with that scene. I love seeing new work by folks like Jessica Dickinson, Hilary Harnischfeger, Sarah Crowner, Sam Moyer, etc… and I feel like there’s more opportunity to be surprised downtown. That said, Chelsea still offers the opportunity to see work by older artists I’ve looked to as I’ve shaped myself as a painter. 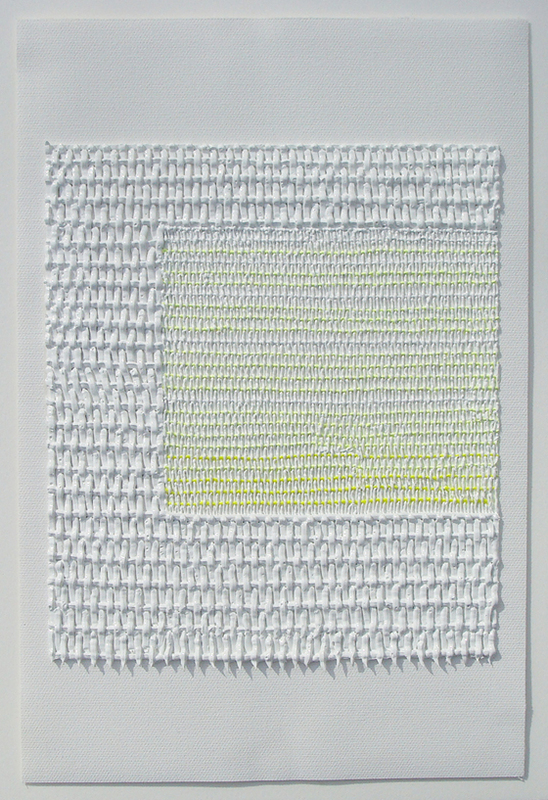 Sikkema Jenkins just picked up Sheila Hicks (who is now in her seventies) and I’m very excited about that move. Her first show there ends on the 2nd. I had the opportunity to meet Hicks last summer in Philly and I asked her if she ever experiences self-doubt at this point in her career. She answered “every morning at 6am.” That kind of thing just keeps me going. So Chelsea continues to be the place where I go to see new work by those who have been slugging away at it for decades.